The official birthstone of September, cool blue sapphire signifies the seasons' shift from summer to autumn. The sapphire brings a sense of tranquility and symbolizes nobility, truth, sincerity, and faithfulness. For centuries it has been associated with royalty and has decorated religious and ceremonial dress. Sapphire is suggested as the gemstone for the 23rd and 45th wedding anniversaries. 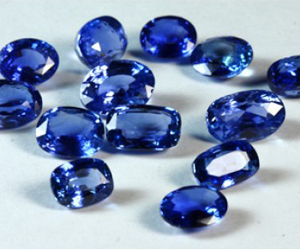 Sapphires are mined in Australia, Sri Lanka, Burma, and Thailand.